At an estimated cost of over $14.2 billion as of June 2018, it is the most expensive World Cup in history, surpassing the cost of the 2014 FIFA World Cup in Brazil. ^ "Стадион ЧМ-2018 по футболу в Волгограде введен в эксплуатацию" [The 2018 World Cup in Volgograd was put into operation] (in Russian). RIA Novosti. 3 April 2018. Archived from the original on 3 April 2018. Retrieved 31 May 2018. ^ "Luzhniki Stadium". FIFA. Archived from the original on 16 November 2017. Retrieved 15 June 2018. ^ "Spartak Stadium". FIFA. Archived from the original on 14 June 2018. Retrieved 15 June 2018. ^ "Saint Petersburg Stadium". FIFA. Archived from the original on 6 December 2017. Retrieved 15 June 2018. ^ "Fisht Stadium". FIFA. Archived from the original on 15 June 2018. Retrieved 15 June 2018. ^ "Volgograd Arena". FIFA. Archived from the original on 15 October 2017. Retrieved 15 June 2018. ^ "Rostov Arena". FIFA. Archived from the original on 15 June 2018. Retrieved 15 June 2018. ^ "Nizhny Novgorod Stadium". FIFA. Archived from the original on 15 June 2018. Retrieved 15 June 2018. ^ "Kazan Arena". FIFA. Archived from the original on 15 June 2018. Retrieved 15 June 2018. ^ "Samara Arena". FIFA. Archived from the original on 12 June 2018. Retrieved 15 June 2018. ^ "Mordovia Arena". FIFA. Archived from the original on 14 May 2018. Retrieved 15 June 2018. ^ "Kaliningrad Stadium". FIFA. Archived from the original on 8 October 2017. Retrieved 15 June 2018. ^ "Ekaterinburg Arena". FIFA. Archived from the original on 31 March 2018. Retrieved 15 June 2018. ^ "Team Base Camps for 2018 FIFA World Cup confirmed". FIFA.com (Fédération Internationale de Football Association). 9 February 2018. Archived from the original on 10 February 2018. ^ "Croatia defender Pivaric says he has 'excellent' 1st impression of training base". fourfourtwo.com.au. 12 June 2018. Archived from the original on 15 June 2018. Retrieved 15 June 2018. ^ McNulty, Phil (12 June 2018). "World Cup 2018: Life inside the England bubble – what they can expect in Repino". BBC. Archived from the original on 15 June 2018. Retrieved 15 June 2018. ^ Grohmann, Karolos (14 June 2018). "Soccer: No tropical paradise? No problem for Germany, says midfielder Kroos". Reuters. Archived from the original on 7 July 2018. Retrieved 7 July 2018. ^ a b "Russia's 2018 World Cup costs grow by $600 million". USA Today. 24 October 2017. Archived from the original on 1 May 2018. ^ "Russian Prime Minister Dmitry Medvedev says 2018 FIFA World Cup to cost 20 billion dollars". NDTV. 13 June 2013. Archived from the original on 2 March 2018. ^ "2018 World Cup: Russia to spend $5 billion on transport, despite cuts". Russia Beyond. 7 January 2016. Archived from the original on 2 March 2018. ^ "Бюджет чемпионата мира 2018 года – около €1 млрд" [The budget for the 2018 World Cup is about €1 billion]. Чемпионат (in Russian). 18 September 2015. Archived from the original on 5 January 2016. Retrieved 31 May 2018. ^ "На подготовку транспортной инфраструктуры ЧМ-2018 в России потрачено 228 млрд" [228 billion spent on preparation of the transport infrastructure of the World Cup 2018]. sport24.ru (in Russian). 3 May 2018. Archived from the original on 1 June 2018. Retrieved 31 May 2018. ^ a b "Алмазная радиосвязь". Газета.Ru (in Russian). 30 March 2018. Archived from the original on 1 June 2018. Retrieved 31 May 2018. ^ "В Мордовии к ЧМ-2018 прошли классификацию два хостела и мотель". info-rm.com. 16 January 2018. Archived from the original on 14 March 2018. ^ "Трамвайная линия до стадиона для ЧМ в Самаре готова на 89%". samru.ru. 22 February 2018. Archived from the original on 2 March 2018. 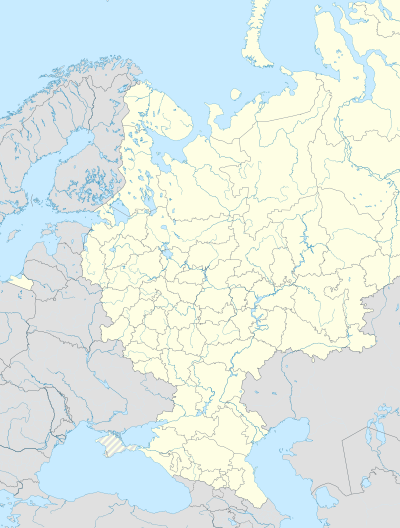 ^ "Kaliningrad airport's new terminal put in operation". Russian Aviation Insider. 26 July 2017. Archived from the original on 22 May 2018. Retrieved 4 June 2018. ^ "В Екатеринбурге увеличились расходы на подготовку к проведению ЧМ-2018". regnum.ru (in Russian). 14 June 2018. Archived from the original on 16 June 2018. Retrieved 16 June 2018. ^ "Новый рекорд волонтерской программы ЧМ-2018" [New record of the Volunteer program of the World Cup 2018]. welcome2018.com (in Russian). 17 January 2017. Archived from the original on 22 August 2017. Retrieved 31 May 2018. ^ "Набор волонтеров на ЧМ-2018 установил новый рекорд Чемпионатов мира" [A set of volunteers at the World Cup 2018 set a new World Cup record] (in Russian). FIFA. 17 January 2017. Archived from the original on 1 June 2018. Retrieved 31 May 2018. ^ "Чемпионат мира по футболу FIFA 2018 в России – Волонтерская программа: F.A.Q." [FIFA 2018 World Cup in Russia – Volunteer program: F.A.Q.] (in Russian). FIFA. Archived from the original on 10 October 2016. Retrieved 31 May 2018. ^ a b Ames, Nick (27 March 2018). "World Cup 2018: what is a Fan ID and do I need one to watch games in Russia?". The Guardian. Archived from the original on 31 March 2018. Retrieved 10 June 2018. ^ a b Wildie, Tom (8 June 2018). "Aussie soccer fan's World Cup dream crushed by new Russian visa rejection". ABC News. Archived from the original on 9 June 2018. Retrieved 10 June 2018. ^ a b "What World Cup fans going to Russia should know". BBC. 6 June 2018. Archived from the original on 10 June 2018. Retrieved 10 June 2018. ^ "Match schedules for FIFA Confederations Cup 2017 and 2018 FIFA World Cup unveiled". FIFA. 24 July 2015. Archived from the original on 5 October 2017. ^ "FIFA World Cup Russia 2018 – Match Schedule" (PDF). FIFA. Archived (PDF) from the original on 11 September 2017. ^ a b "FIFA World Cup Russia 2018 – Match Schedule" (PDF). FIFA. 20 December 2017. Archived (PDF) from the original on 24 June 2018. Retrieved 20 December 2017. ^ "The FIFA/Coca-Cola World Ranking – October 2017". FIFA. Archived from the original on 16 October 2017. Retrieved 16 October 2017. ^ "World Cup 2018 fixtures: full schedule, results and match dates". The Telegraph. 14 June 2018. Archived from the original on 14 June 2018. Retrieved 14 June 2018. ^ "World Cup 2018 Opening Ceremony: What time will it start and when will Robbie Williams feature?". The Telegraph. 13 June 2018. Archived from the original on 13 June 2018. Retrieved 14 June 2018. ^ "Robbie Williams show at World Cup opening ceremony is too short to ever be dull". The Guardian. 14 June 2018. Archived from the original on 14 June 2018. Retrieved 14 June 2018. ^ a b c d e "World Cup 2018: Ronaldo and Robbie Williams star in opening ceremony". BBC. 14 June 2018. Archived from the original on 15 June 2018. Retrieved 15 June 2018. ^ White, Adam (27 June 2018). "What does Didier Deschamps want from his France team? If only he knew". The Guardian. Archived from the original on 28 June 2018. Retrieved 28 June 2018. ^ "Tie-breakers for Russia 2018 groups". FIFA. 20 June 2018. Archived from the original on 25 June 2018. Retrieved 26 June 2018. ^ "Match report – Group B – Morocco v IR Iran" (PDF). FIFA.com. Fédération Internationale de Football Association. 15 June 2018. Retrieved 15 June 2018. ^ "Match report – Group B – Portugal v Spain" (PDF). FIFA.com. Fédération Internationale de Football Association. 15 June 2018. Retrieved 15 June 2018. ^ "Match report – Group B – Portugal v Morocco" (PDF). FIFA.com. Fédération Internationale de Football Association. 20 June 2018. Retrieved 20 June 2018. ^ "Match report – Group B – IR Iran v Spain" (PDF). FIFA.com. Fédération Internationale de Football Association. 20 June 2018. Retrieved 20 June 2018. ^ "Match report – Group B – IR Iran v Portugal" (PDF). FIFA.com. Fédération Internationale de Football Association. 25 June 2018. Retrieved 25 June 2018. ^ "Match report – Group B – Spain v Morocco" (PDF). FIFA.com. Fédération Internationale de Football Association. 25 June 2018. Retrieved 25 June 2018. ^ "Match report – Group C – France v Australia" (PDF). FIFA.com. Fédération Internationale de Football Association. 16 June 2018. Retrieved 16 June 2018. ^ "Match report – Group C – Peru v Denmark" (PDF). FIFA.com. Fédération Internationale de Football Association. 16 June 2018. Retrieved 16 June 2018. ^ "Match report – Group C – Denmark v Australia" (PDF). FIFA.com. Fédération Internationale de Football Association. 21 June 2018. Retrieved 21 June 2018. ^ "Match report – Group C – France v Peru" (PDF). FIFA.com. Fédération Internationale de Football Association. 21 June 2018. Retrieved 21 June 2018. ^ "Match report – Group C – Denmark v France" (PDF). FIFA.com. Fédération Internationale de Football Association. 26 June 2018. Retrieved 26 June 2018. ^ "Match report – Group C – Australia v Peru" (PDF). FIFA.com. Fédération Internationale de Football Association. 26 June 2018. Retrieved 26 June 2018. ^ "Match report – Group E – Costa Rica v Serbia" (PDF). FIFA.com. Fédération Internationale de Football Association. 17 June 2018. Retrieved 17 June 2018. ^ "Match report – Group E – Brazil v Switzerland" (PDF). FIFA.com. Fédération Internationale de Football Association. 17 June 2018. Retrieved 17 June 2018. ^ "Match report – Group E – Brazil v Costa Rica" (PDF). FIFA.com. Fédération Internationale de Football Association. 22 June 2018. Retrieved 22 June 2018. ^ "Match report – Group E – Serbia v Switzerland" (PDF). FIFA.com. Fédération Internationale de Football Association. 22 June 2018. Retrieved 22 June 2018. ^ "Match report – Group E – Serbia v Brazil" (PDF). FIFA.com. Fédération Internationale de Football Association. 27 June 2018. Retrieved 27 June 2018. ^ "Match report – Group E – Switzerland v Costa Rica" (PDF). FIFA.com. Fédération Internationale de Football Association. 27 June 2018. Retrieved 27 June 2018. ^ "Match report – Group H – Colombia v Japan" (PDF). FIFA.com. Fédération Internationale de Football Association. 19 June 2018. Retrieved 19 June 2018. ^ "Match report – Group H – Poland v Senegal" (PDF). FIFA.com. Fédération Internationale de Football Association. 19 June 2018. Retrieved 19 June 2018. ^ "Match report – Group H – Japan v Senegal" (PDF). FIFA.com. Fédération Internationale de Football Association. 24 June 2018. Retrieved 24 June 2018. ^ "Match report – Group H – Poland v Colombia" (PDF). FIFA.com. Fédération Internationale de Football Association. 24 June 2018. Retrieved 24 June 2018. ^ "Match report – Group H – Japan v Poland" (PDF). FIFA.com. Fédération Internationale de Football Association. 28 June 2018. Retrieved 28 June 2018. ^ "Match report – Group H – Senegal v Colombia" (PDF). FIFA.com. Fédération Internationale de Football Association. 28 June 2018. Retrieved 28 June 2018. ^ Kelly, Ryan (15 July 2018). "Mandzukic makes World Cup history with own goal against France in Russia 2018 final". Goal.com. Retrieved 16 July 2018. ^ "Players: Goals scored". FIFA.com. Fédération Internationale de Football Association. Retrieved 24 June 2018. ^ "World Cup by the numbers - 169 goals, 29 penalties, 10 late winners, 4 red cards". ESPN. 16 July 2018. Archived from the original on 17 July 2018. Retrieved 17 July 2018. ^ "VAR effect results in cleanest World Cup since 1986 after no red cards are issued in opening 11 games". The Telegraph. 17 June 2018. Archived from the original on 18 June 2018. Retrieved 17 July 2018. ^ "Golden consolation for magical Modric". FIFA. 15 July 2018. Archived from the original on 16 July 2018. Retrieved 16 July 2018. ^ "Vote for Goal of the Tournament". FIFA. 15 July 2018. Retrieved 25 July 2018. ^ "FIFA World Cup Fan Dream Team". FIFA. 18 July 2018. Archived from the original on 26 June 2018. Retrieved 18 July 2018. ^ "Fan Dream Team and prize winners revealed!". FIFA. 23 July 2018. Retrieved 25 July 2018. ^ "Kane crowned King, Mina the PPG VIP". FIFA. 17 July 2018. Retrieved 25 July 2018. ^ "FIFA World Cup Prize Money" (PDF). FIFA. 27 October 2017. Archived (PDF) from the original on 29 October 2017. Retrieved 28 October 2017. ^ "'Russia's heart & soul': World Cup 2018 logo unveiled in Moscow (PHOTOS, VIDEO)". RT. 28 October 2014. Archived from the original on 29 October 2014. Retrieved 29 October 2014. ^ "Font scandal at FIFA World Cup". Archived from the original on 23 July 2018. Retrieved 22 July 2018. ^ "Russia 2018: World Cup mascot Zabivaka the wolf unveiled in Moscow". The Guardian. 21 October 2016. Archived from the original on 25 March 2017. Retrieved 10 June 2018. ^ "Ticket sales for 2018 FIFA World Cup to start on 14 September 2017". FIFA. 12 September 2017. Archived from the original on 13 November 2017. ^ "Russia to ease visa regime for World Cup fans in 2018". Voice of Russia. 11 July 2014. Archived from the original on 21 October 2014. Retrieved 6 June 2015. ^ Bate, Adam (16 July 2014). "World Cup Final: Was Lionel Messi Really a Disappointment in Brazil or Have We Just Become Numb to His Genius?". Sky Sports. ^ "World Cup 2018: New ball to be used for knockout stage". BBC Sport. 26 June 2018. Retrieved 14 March 2019. ^ Teather, Jamie (16 June 2018). "World Cup ball: Adidas Telstar 18 'a problem for goalkeepers'". Evening Standard. Retrieved 17 June 2018. ^ Price, Steve (28 March 2018). "Why Nike Contract Could Hurt England's Preparations For Russia 2018 World Cup". Forbes. Retrieved 17 June 2018. ^ "World Cup 2018: Adidas has a problem with the Telstar 18, is Messi the GOAT?". News.com.au. Retrieved 14 March 2019. ^ "Telstar 18 balls burst during France". AS.com. 16 June 2018. Retrieved 14 March 2019. ^ Yin-Poole, Wesley. "FIFA 18 gets free World Cup mode in May". Archived from the original on 1 May 2018. Retrieved 14 May 2018. ^ Dayus, Oscar (30 May 2018). "FIFA 18 World Cup Update Out Now For Free, Here's What It Adds". GameSpot. Retrieved 14 March 2019. ^ "Brand collaborations". FIFA. Retrieved 7 October 2018. ^ "Panini World Cup sticker album: Inside story behind the craze". Sports Illustrated. Retrieved 7 October 2018. ^ "12 Years Running: Panini's FIFA World Cup™ Digital Sticker Album is More Popular Than Ever". Coca-Cola Company. Retrieved 7 October 2018. ^ "Fifa contacts McLaren over doping claims in football". BBC. 21 November 2017. Archived from the original on 16 December 2017. ^ Conn, David (20 December 2017). "Doctor sacked by Fifa was investigating alleged Russian football doping". The Guardian. Archived from the original on 22 December 2017. Retrieved 22 December 2017. ^ "Update on the investigations following the McLaren reports". FIFA. 22 May 2018. Archived from the original on 22 May 2018. ^ "Russians to take no part in World Cup drug testing: FIFA". Reuters. 24 May 2018. Archived from the original on 28 May 2018. ^ Syal, Rajeev (3 December 2010). "World Cup 2018 win raises Russian racism fears". The Guardian. Archived from the original on 20 September 2013. Retrieved 20 August 2011. ^ "Yaya Toure: Black players may boycott 2018 Russia World Cup". BBC Sport. 25 October 2013. Archived from the original on 18 January 2016. ^ Munro, Kelsey (11 June 2018). "Racism in Russia and FIFA's 3-step plan to tackle it". Sbs.com.au. Archived from the original on 12 June 2018. ^ McCormick, Joseph Patrick (25 March 2014). "Campaigns demand FIFA bans Russia from hosting 2018 World Cup due to anti-gay law". Pink News. Archived from the original on 6 October 2014. ^ Lavin, James (28 February 2014). "Why FIFA Needs to Move the World Cup". advocate.com. Archived from the original on 6 October 2014. ^ "Fifa urged to rethink staging 2018 World Cup in Russia". BBC. 21 March 2014. Archived from the original on 7 April 2014. Retrieved 17 April 2014. ^ Winter, Stuart (23 March 2014). "US calls for Fifa to drop Russia from hosting World Cup in 2018". Daily Express. Retrieved 17 April 2014. ^ "Sepp Blatter: Russia will host 2018 World Cup despite Crimea". BBC Sport. 21 March 2014. Archived from the original on 28 April 2014. Retrieved 17 April 2014. ^ Ornstein, David (17 November 2014). "World Cup: Former FA chief David Bernstein calls for boycott". BBC Sport. Archived from the original on 17 November 2014. Retrieved 17 November 2014. ^ Dunbar, Graham. "FIFA under fire after report on Qatar, Russia". Associated Press. Archived from the original on 16 November 2014. Retrieved 14 November 2014. ^ Roan, Dan (17 November 2014). "Greg Dyke: FA demands full report findings into World Cup corruption". BBC Sport. Archived from the original on 17 November 2014. Retrieved 17 November 2014. ^ Conway, Richard. "FIFA corruption report: Who is to blame and what happens now?". BBC Sport. Archived from the original on 14 November 2014. Retrieved 14 November 2014. ^ "Michael Garcia: FIFA investigator resigns in World Cup report row". BBC. 17 December 2014. Archived from the original on 15 January 2016. ^ Rumsby, Ben (4 June 2015). "Fifa in crisis: FBI extends investigation to Russia 2018 and Qatar 2022 World Cup bids". The Telegraph. Archived from the original on 4 June 2015. Retrieved 4 June 2015. ^ Riach, James (3 June 2015). "FBI investigating Fifa's awarding of 2018 and 2022 World Cups – report". The Guardian. Archived from the original on 4 June 2015. Retrieved 4 June 2015. ^ "'Russia & Qatar may lose World Cups' – Fifa official". BBC News. 7 June 2015. Archived from the original on 2 August 2015. ^ Gibson, Owen (7 June 2015). "Russia and Qatar may lose World Cups if evidence of bribery is found". The Guardian. Archived from the original on 26 December 2016. ^ Mendick, Robert; Rumsby, Ben (27 June 2017). "Prince William and David Cameron caught up in Fifa corruption scandal". The Daily Telegraph. Archived from the original on 20 January 2018. ^ Osborne, Samuel (14 March 2018). "Theresa May's statement in full as she expels 23 Russian spies from Britain". The Independent. Archived from the original on 14 March 2018. Retrieved 14 March 2018. ^ "Iceland to diplomatically boycott 2018 World Cup in Russia". Russia: RT. Archived from the original on 26 March 2018. Retrieved 28 March 2018. ^ "Moscow official says West is trying to deny Russia World Cup". BBC News. 1 April 2018. Archived from the original on 1 April 2018. Retrieved 1 April 2018. ^ Osborne, Samuel (21 March 2018). "Sergei Skripal: Chemical weapons inspectors arrive in Salisbury to investigate nerve agent attack". The Independent. Archived from the original on 19 June 2018. Retrieved 19 June 2018. ^ Calder, Simon (15 March 2018). "World Cup 2018: England football fans warned of potential 'anti-British harassment' when travelling to Russia". The Independent. Archived from the original on 19 June 2018. Retrieved 19 June 2018. ^ "World Cup 2018: New report highlights MPs' concern for England fans in Russia". BBC News. 8 June 2018. Archived from the original on 19 June 2018. Retrieved 19 June 2018. ^ Mendick, Robert; Luhn, Alec (18 June 2018). "England fans welcomed with open arms in Volgograd ahead of opening 2018 World Cup match against Tunisia". The Daily Telegraph. Archived from the original on 21 June 2018. Retrieved 25 June 2018. ^ Carroll, Oliver (19 June 2018). "World Cup 2018: England fans praise welcome by Russian hosts as they celebrate first win". The Independent. Archived from the original on 19 June 2018. Retrieved 19 June 2018. ^ "Is Russia the real winner of World Cup 2018?". BBC. Archived from the original on 17 July 2018. Retrieved 18 July 2018. ^ "Qatar 2022 will be held in November and December". News.com.au. Archived from the original on 18 July 2018. Retrieved 17 July 2018. ^ "Gianni Infantino: World Cup 2018 the best ever". Goal.com. Archived from the original on 18 July 2018. Retrieved 19 July 2018. ^ "FIFA Confederations Cup Testing 4K; Might Lead to World Cup 'Ultra HD' Broadcast". The Hollywood Reporter. Retrieved 24 November 2018. ^ "4K TV misses its World Cup goal". The Verge. Retrieved 24 November 2018. ^ "Fox, Telemundo Offer a Clearer View of FIFA World Cup Russia". TV Technology. Retrieved 24 November 2018. ^ "World Cup 2018: BBC to show tournament in Ultra HD & virtual reality". BBC Sport. 30 May 2018. Retrieved 24 November 2018. ^ "FuboTV streaming World Cup in 4K resolution". SportsPro. Retrieved 24 November 2018. ^ "Ukrainian public broadcaster decides not to show World Cup matches". Kyiv Post. 12 February 2018. Archived from the original on 14 March 2018. Retrieved 1 March 2018. ^ Carp, Sam. "Ukraine's public broadcaster refuses to show Fifa World Cup". SportsPro. Archived from the original on 14 March 2018. Retrieved 1 March 2018. ^ "Inter Media Group secures World Cup rights in Ukraine". TV Sports Markets. 31 May 2018. Archived from the original on 2 July 2018. Retrieved 1 July 2018. ^ Bershidsky, Leonid (18 June 2018). "You Can Hate Putin But Love the World Cup". Bloomberg. Archived from the original on 19 June 2018. Retrieved 25 June 2018. ^ Gokulan, Dhanusha. "UAE football fans fear missing out on Fifa World Cup action". khaleejtimes.com. Retrieved 26 August 2018. ^ "beIN Sports pulls TV channels from du customers in the UAE". ArabianBusiness.com. Retrieved 26 August 2018. ^ "Etisalat announces FIFA World Cup 2018 package". ArabianBusiness.com. Retrieved 26 August 2018. ^ "FIFA to take legal action against beoutQ over World Cup broadcasts". Arabian Business. Retrieved 26 August 2018. ^ Draper, Kevin (11 October 2017). "Fox and Others Will Feel Pain of U.S. Absence at World Cup". The New York Times. Archived from the original on 24 October 2017. Retrieved 26 October 2017. ^ Deitsch, Richard (11 October 2017). "With USMNT eliminated from World Cup, Fox must refocus coverage plan". Sports Illustrated. Archived from the original on 26 October 2017. Retrieved 26 October 2017. ^ Shaw, Lucas; Novy-Williams, Eben; Broudway, Ira (11 October 2017). "Fox projects up to $20 million in lost World Cup ad sales". Bloomberg. Archived from the original on 26 October 2017. Retrieved 26 October 2017. ^ Steinberg, Brian (3 July 2018). "World Cup Strains to Reverse Sports-Viewing Trends". Variety. Retrieved 14 October 2018. ^ Ingold, Ira Boudway, Eben Novy-Williams, David. "Fox and Telemundo 2018 World Cup ratings are down 44 percent from 2014". Chicago Tribune. Retrieved 14 October 2018. ^ Millerchip, Oliver (16 September 2013). "Gazprom agrees Fifa sponsorship deal". SportsPro. Archived from the original on 7 July 2017. Retrieved 10 May 2017. ^ "Wanda Group becomes new FIFA Partner". FIFA. 18 March 2016. Archived from the original on 24 April 2017. Retrieved 10 May 2017. ^ "Hisense becomes Official Sponsor of 2018 FIFA World Cup". FIFA. 6 April 2017. Archived from the original on 20 May 2017. Retrieved 10 May 2017. ^ "McDonald's looking ahead to 2018". FIFA. 24 October 2014. Archived from the original on 29 May 2017. Retrieved 10 May 2017. ^ Carp, Sam (20 December 2017). "Mengniu Group added to Fifa World Cup sponsor line-up". SportsPro. Retrieved 20 December 2017. ^ "Egypt government selected as regional sponsor for 2018 FIFA World Cup". Egypt Independent. 13 June 2018. Archived from the original on 13 June 2018. Retrieved 13 June 2018. ^ a b Long, Danielle (11 June 2018). "More Chinese sponsors sign up for Fifa World Cup". The Drum. Archived from the original on 14 March 2018. Retrieved 13 June 2018. ^ Carp, Sam (8 February 2018). "Fifa adds latest Chinese sponsor for World Cup". SportsPro. Archived from the original on 14 March 2018. Retrieved 5 March 2018. ^ "Alfa-Bank unveiled as first-ever Regional Supporter for the FIFA World Cup". FIFA. 18 July 2016. Archived from the original on 21 May 2017. Retrieved 10 May 2017. ^ "Alrosa completes line-up of European Regional Supporters of the 2018 FIFA World Cup". FIFA. 23 April 2018. Archived from the original on 25 April 2018. Retrieved 24 April 2018. ^ Carp, Sam (21 March 2018). "Fifa World Cup adds Rostelecom as regional partner". SportsPro. Archived from the original on 1 June 2018. Retrieved 22 March 2018. ^ "Russian Railways announced as an Official European Supporter of the 2018 FIFA World Cup". FIFA. 5 April 2018. Archived from the original on 16 April 2018. Retrieved 16 April 2018. The 2016 OFC Nations Cup was the 10th edition of the OFC Nations Cup, the quadrennial international men's football championship of Oceania organised by the Oceania Football Confederation (OFC). The tournament was played between 28 May and 11 June 2016 in Port Moresby, Papua New Guinea. The winner (New Zealand) qualified for the 2017 FIFA Confederations Cup in Russia. Similar to the previous edition in 2012, the group stage of the tournament also doubled as the second round of the 2018 FIFA World Cup qualification tournament for the Oceania region. The top six teams of this tournament (i.e. the top three teams of each group in the group stage) advanced to the third round of World Cup qualifying, to be played between March and October 2017, with the winners of the third round proceeding to the inter-confederation play-offs in November 2017. This means that once again, the team that wins the qualifying competition and advances to the intercontinental play-off may be different from the team that wins the OFC Nations Cup and represents the OFC at the 2017 FIFA Confederations Cup. The defending champions Tahiti, who had won their first title at the 2012 OFC Nations Cup, were eliminated in the Group stage. The 2018 FIFA World Cup qualification process was a series of tournaments organised by the six FIFA confederations to decide 31 of the 32 teams which would play in the 2018 FIFA World Cup, with Russia qualifying automatically as hosts. All 210 remaining FIFA member associations were eligible to enter the qualifying process, and for the first time in World Cup history, all eligible national teams registered for the preliminary competition, but Zimbabwe and Indonesia were disqualified before playing their first matches. Bhutan, South Sudan, Gibraltar and Kosovo made their FIFA World Cup qualification debuts.While the main qualifying draw took place at the Konstantinovsky Palace in Strelna, Saint Petersburg, on 25 July 2015, qualification matches were played before that. The first, between Timor-Leste and Mongolia, began in Dili on 12 March 2015 as part of the AFC's qualification, with East Timorese player Chiquito do Carmo scoring the first goal in qualification. Matches were also played in CONCACAF prior to the main draw. The Asian section of the 2018 FIFA World Cup qualification acted as qualifiers for the 2018 FIFA World Cup, held in Russia, for national teams which are members of the Asian Football Confederation (AFC). 4.5 slots (4 direct slots and 1 inter-confederation play-off slot) in the final tournament were available for AFC teams.On 16 April 2014, the AFC Executive Committee approved a proposal to merge the preliminary qualification rounds of the FIFA World Cup and the AFC Asian Cup, which expanded to 24 teams starting in 2019. Therefore, the first two rounds of the FIFA World Cup qualifiers also acted as qualifiers for the 2019 AFC Asian Cup in the United Arab Emirates. The European section of the 2018 FIFA World Cup qualification acted as qualifiers for the 2018 FIFA World Cup, which is being held in Russia, for national teams which are members of the Union of European Football Associations (UEFA). Apart from Russia, who qualified automatically as hosts, a total of 13 slots in the final tournament were available for UEFA teams.The qualifying format was confirmed by the UEFA Executive Committee meeting on 22–23 March 2015 in Vienna.The qualification process started on 4 September 2016, almost two months after UEFA Euro 2016, and ended on 14 November 2017. Belgium, England, France, Germany, Iceland (for the first time), Poland, Portugal, Serbia, and Spain qualified in the first round by winning their groups. Croatia, Denmark, Sweden and Switzerland qualified by winning their playoffs. The second round of AFC matches for 2018 FIFA World Cup qualification (and 2019 AFC Asian Cup qualification) was played from 24 May 2015 to 29 March 2016. The third round of AFC matches for 2018 FIFA World Cup qualification was played from 1 September 2016 to 5 September 2017. The third round of CAF matches for 2018 FIFA World Cup qualification was played from 7 October 2016 to 14 November 2017. The 2018 FIFA World Cup qualification UEFA Group C was one of the nine UEFA groups for 2018 FIFA World Cup qualification. The group consisted of six teams: Germany, Czech Republic, Northern Ireland, Norway, Azerbaijan, and San Marino. The draw was for the first round (group stage) which was not held as part of the 2018 FIFA World Cup Preliminary Draw on 25 July 2015, starting 18:00 MSK (UTC+3), at the Konstantinovsky Palace in Strelna, Saint Petersburg, Russia.The group winners, Germany, who finished with a 100% record, qualified directly for the 2018 FIFA World Cup. The group runners-up, Northern Ireland, advanced to the play-offs as one of the best 8 runners-up, where they lost to Switzerland and thus failed to qualify. The 2018 FIFA World Cup qualification UEFA Group F was one of the nine UEFA groups for 2018 FIFA World Cup qualification. The group consisted of six teams: England, Slovakia, Scotland, Slovenia, Lithuania, and Malta. The draw for the first round (group stage) was held as part of the 2018 FIFA World Cup Preliminary Draw on 25 July 2015, starting 18:00 MSK (UTC+3), at the Konstantinovsky Palace in Strelna, Saint Petersburg, Russia.The group winners, England, qualified directly for the 2018 FIFA World Cup. The group runners-up, Slovakia, were eliminated as the worst runners-up. The 2018 FIFA World Cup qualification UEFA Group G was one of the nine UEFA groups for 2018 FIFA World Cup qualification. The group consisted of six teams: Spain, Italy, Albania, Israel, North Macedonia, and Liechtenstein. The draw for the first round (group stage) was held as part of the 2018 FIFA World Cup Preliminary Draw on 25 July 2015, starting 18:00 MSK (UTC+3), at the Konstantinovsky Palace in Strelna, Saint Petersburg, Russia.The group winners, Spain, qualified directly for the 2018 FIFA World Cup. The group runners-up, Italy, advanced to the play-offs as one of the best 8 runners-up, where they lost to Sweden and thus failed to qualify for the first time since 1958. The 2018 FIFA World Cup qualification UEFA Group I was one of the nine UEFA groups for 2018 FIFA World Cup qualification. The group consisted of six teams: Croatia, Iceland, Ukraine, Turkey, Finland, and Kosovo. The draw for the first round (group stage) was held as part of the 2018 FIFA World Cup Preliminary Draw on 25 July 2015, starting 18:00 MSK (UTC+3), at the Konstantinovsky Palace in Strelna, Saint Petersburg, Russia. Kosovo was added to the group after the draw, after becoming FIFA members together with Gibraltar in May 2016, and UEFA decided not to put Kosovo in group H together with Bosnia and Herzegovina for security reasons.The group winners, Iceland, qualified directly for the 2018 FIFA World Cup. The group runners-up, Croatia, advanced to the play-offs as one of the best 8 runners-up, where they won against Greece and thus qualified for the tournament as well. This was the first time Ukraine was eliminated after the first round, as the team had been eliminated in 1998, 2002, 2010 and 2014 after the play-offs, and qualified in 2006. The draw for the 2018 FIFA World Cup took place on 1 December 2017 at the State Kremlin Palace in Moscow, Russia. It determined the group in which each of the 32 qualified national teams will play in at the start of the tournament. The teams were divided into four pots of eight, with one team selected from each pot to form a group. Unlike previous editions of the World Cup, all pots were determined by each national team's October 2017 FIFA World Ranking, with Pot 1 containing the highest-ranked teams, Pot 2 containing the next highest-ranked teams, and so on until Pot 4, containing the lowest ranked teams; in previous editions only one pot containing the highest-ranked teams was determined by rank, with the other three pots determined by continental confederation. The hosts continued to be placed in Pot 1 and treated as a seeded team, and therefore Pot 1 consisted of hosts Russia and the seven highest-ranked teams that qualify for the tournament. The draw sequence started with pot 1 and ended with pot 4.As with previous editions, no group had more than one team from any continental confederation with the exception of UEFA, which had at least one, but no more than two in a group. Antonio Miguel Mateu Lahoz (Spanish pronunciation: [anˈtonjo miˈɣel maˈteu laˈoθ]; born 12 March 1977) is a Spanish international referee who refereed at the 2014 FIFA World Cup qualifiers. He was also selected to referee at the 2018 FIFA World Cup qualifiers and the 2018 FIFA World Cup. He made his international debut on 26 May 2008, in a friendly match between Netherlands and Greece national under-19 football team. He was later called-up for European club cup matches (first for the UEFA Cup during the 2008–09 season, then for the Champions League during the 2010–11 season).He refereed three international matches during the UEFA Euro 2012 qualifying, and later was called-up as referee for the Men's football tournament at 2012 Summer Olympics in London.